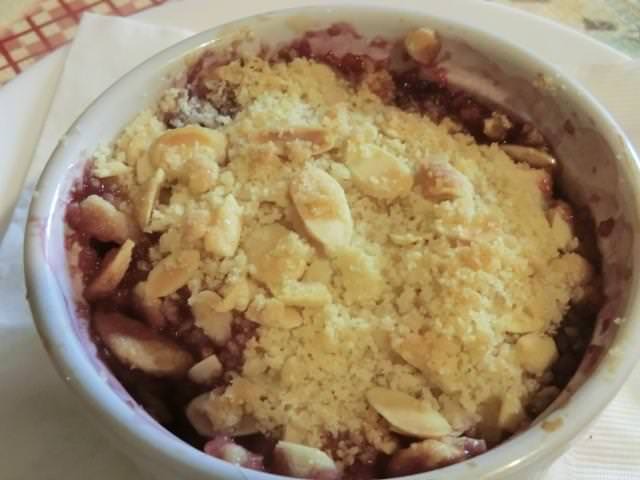 Single Serving Apple and Blueberry Desserts | Cooking is Fun … Really!! My pantry is rather sparse in terms of dessert ingredients, other than the basics. And my fruit crisper drawer is limited to a few apples (Red Delicious), so when I was planning on a seasonal fruit-based dessert for Thanksgiving (I don’t like pumpkin), the pickings were slim. I decided on a single serving dessert that could be made and served in a cup sized ramekin. I was intrigued by two possibilities and, rather than decide, I made them both. 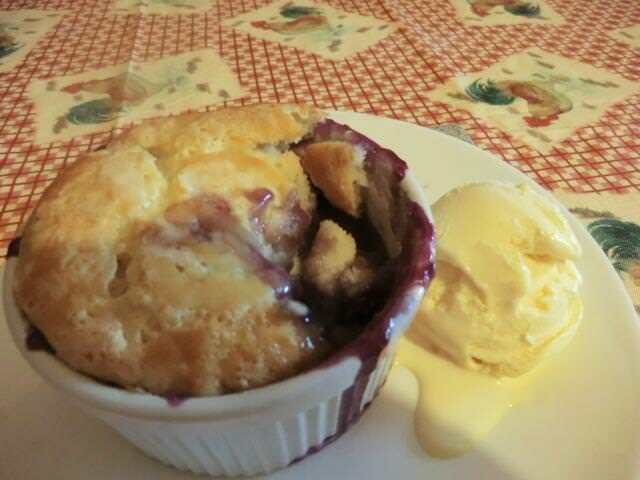 I included blueberries from the freezer in the apple crumble for colour and bit of extra flavour. 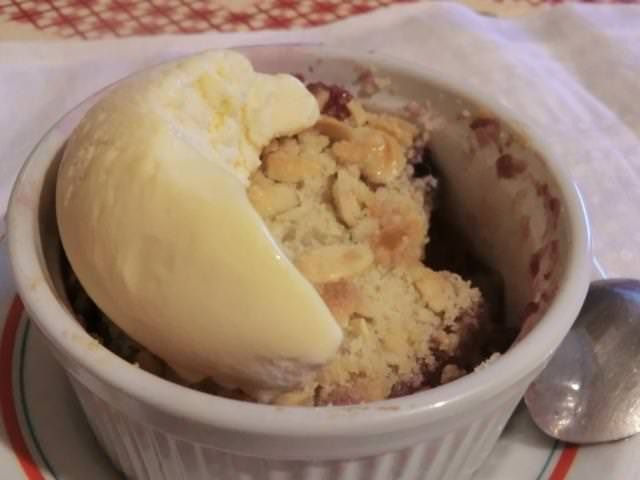 The original apple crumble dessert recipe also used rhubarb. * If using frozen blueberries, do not thaw. ** I tried 2 tbsp and thought it needed a bit more sugar next time. Use a ramekin that holds a bit more than 1 cup. Place onto a baking sheet for ease of transport and in case of boil overs. 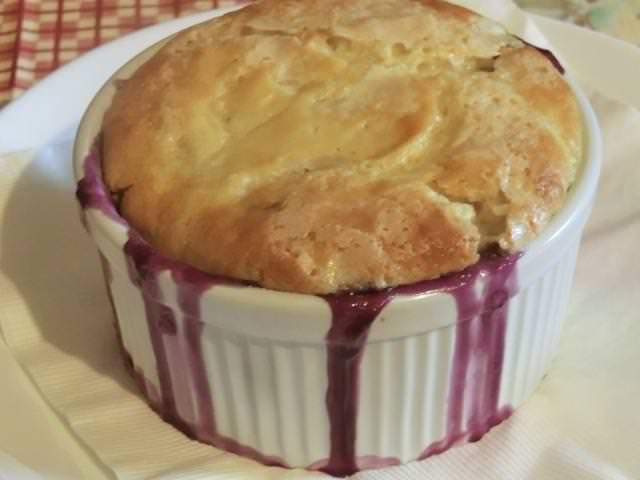 Place the blueberries in the bottom of the ramekin and sprinkle the lemon juice over the top. Stir a bit to coat the blueberries. In a small bowl, combine the flour, baking powder and sugar. Stir to combine. Add the milk and melted butter and stir until the dry ingredients are evenly moistened. Gently spoon the cake batter in a layer over the top of the blueberries. 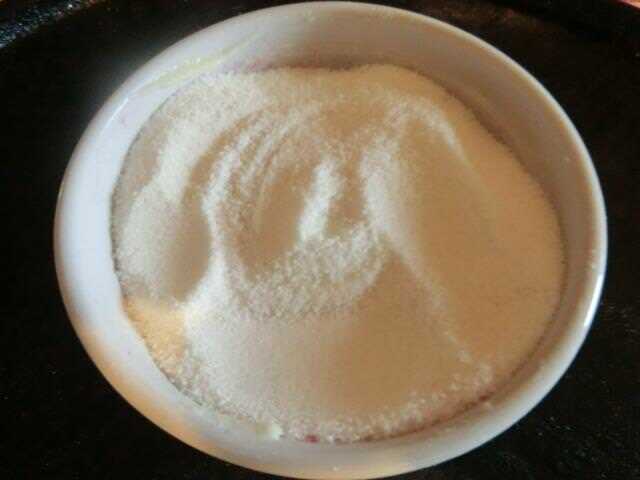 In a small bowl, combine the sugar and cornstarch. Spoon evenly over the top of the cake batter. Bake for 45-50 minutes or until the top is golden brown. 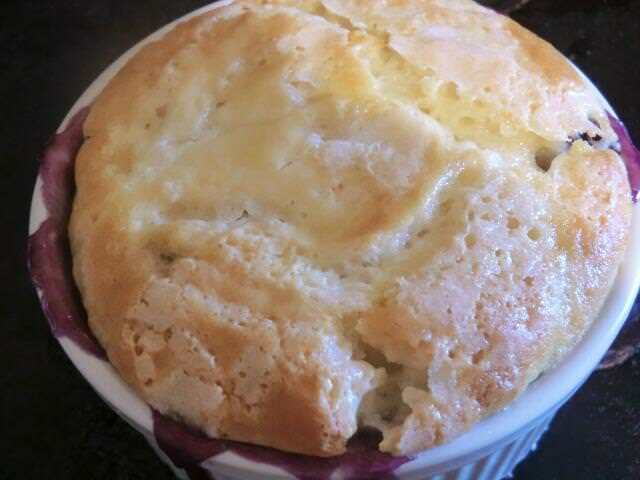 Serve with a scoop of vanilla ice cream or pouring custard/Creme Anglaise. * I didn’t have any rolled oats in the pantry so I added the almonds for texture and bulk. Preheat the oven to 350-360 deg F/180°C. Lightly oil a 1 cup ramekin with a neutral tasting oil like canola. 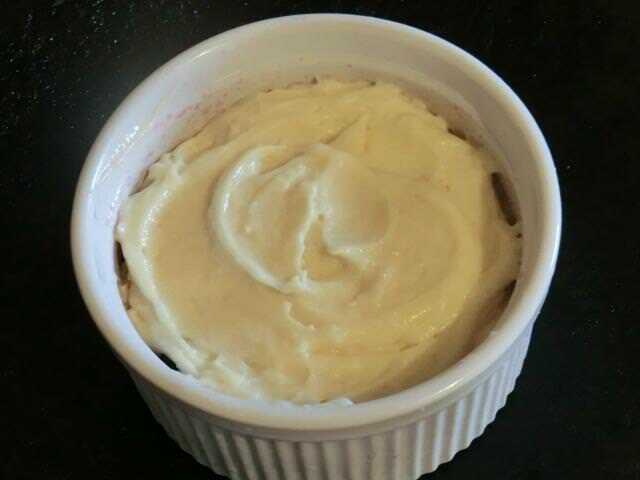 Place the ramekin onto a baking sheet for ease of transport and in case of boil overs. 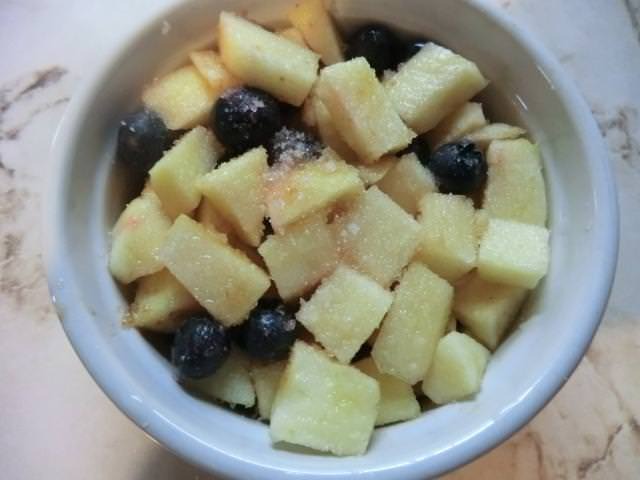 Place the prepared apple and blueberries in a bowl. Sprinkle the lemon juice over the top of the fruit; add the brown sugar and stir through. Place the fruit into the ramekin, packing down a bit as needed. 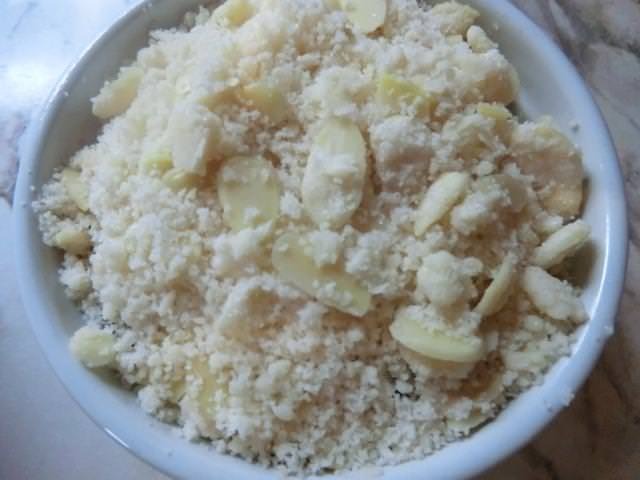 Place the flour, butter, sugar and oats in a medium bowl. Use your fingers or a fork, rub in the butter until it’s well combined and large crumbs form. Bake for 15 to 20 minutes or until the topping is golden and bubbling. Serve with sweetened whipped cream, ice cream or pouring custard/Creme Anglaise. I love these! As soon as my A/C is fixed, I am going back to the oven and making both – lovely! Thank you for the flattering comment. You can use whatever fruit you want for either of them though you may want to adjust sugar levels to suit the sweetness of the fruit and personal preference. I’m making an all apple crumble today for supper. And I have another apple in the fridge so I’m debating on whether or not to make some crepes (tomorrow if I don’t get a work call or on the weekend) and fill a couple with apple sauteed in butter, cinnamon and some sugar. Two tasty treats to end your Thanksgiving meal. Both of these could be a bit dangerous for me! I’m far more likely to make something like this instead of a big pan! Which to choose, which to choose, lol! They look delicious! Adding apples to berries in a crumble has always been my way to stretch the amount of berries (they are very expensive here). You also don’t like pumpkin! Wow! Either my memory is bad or I never realised it. I really don’t like pumpkin and apart from my brother every single person I know (even from the web) loves it! What a relief I’m not alone. I have eaten it and it’s not ‘horrible’ but it’s probably last on my list of preferences for pies and other desserts I’d choose.